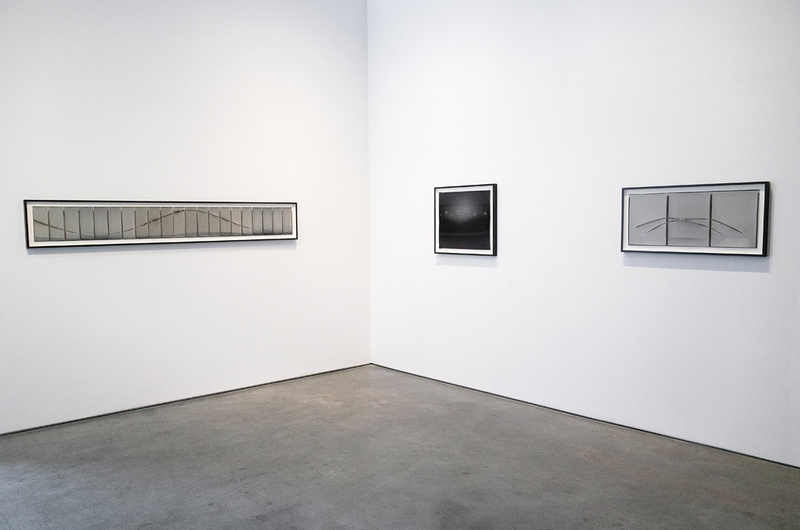 Yossi Milo Gallery is pleased to present Direct Positive , an exhibition of new sun-burned photographs by Chris McCaw. 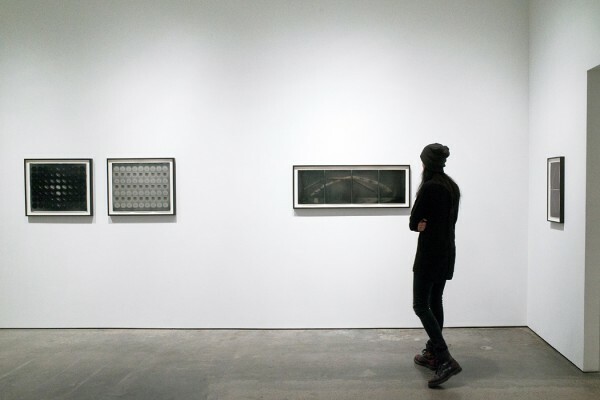 The exhibition will open on Thursday, March 3, and will be on view through Saturday, April 9, with a reception for the artist on Friday, March 4 from 6:00 – 8:00 pm. This is the artist’s second solo exhibition at the gallery. 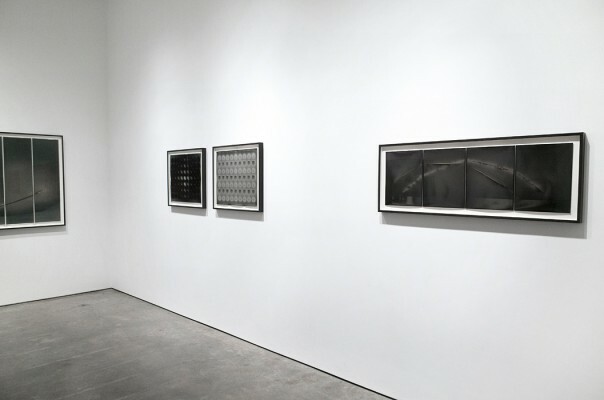 Chris McCaw’s most recent work with high powered optics and vintage gelatin silver papers are collaborations between the artist and the sun. Remaining grounded in the tradition of landscape photography, McCaw has begun using lines burned by the sun as abstract elements to create pieces akin to line drawing. Direct Positive features complex pieces from the Heliograph and Poly-Optic series, as well as his most ambitious multi-panel Sunburn pieces to date. 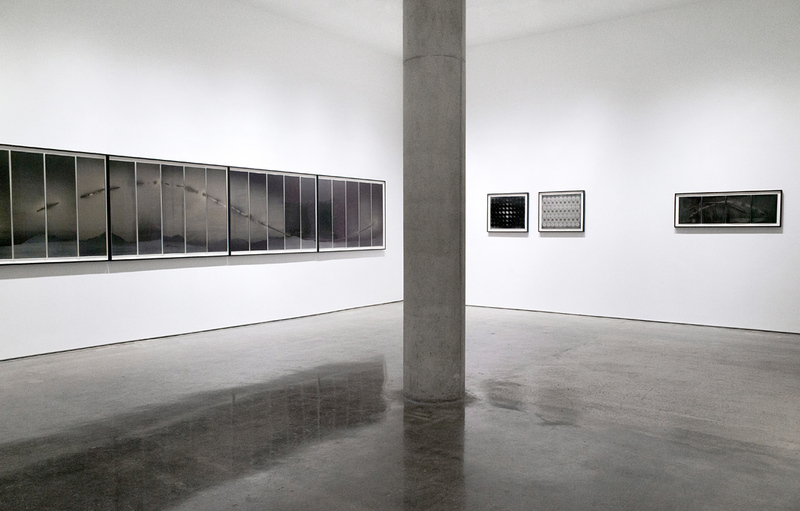 Chris McCaw builds his own large-format cameras and outfits them with powerful lenses typically used for military surveillance and aerial reconnaissance. Instead of film, McCaw inserts expired fiber-based gelatin silver photo paper directly into the camera. Pointing the lens at the sun, McCaw makes recordings ranging from thirty seconds to as long as 36 hours. The sun, intensified by the lens, scorches its path across the paper while creating a solarized image of the landscape or seascape below – a “direct positive” image made in-camera, without an intervening negative. These burned lines and holes are tangible traces of the act of making each photograph: marking time, recording location, mapping weather conditions and channeling light. 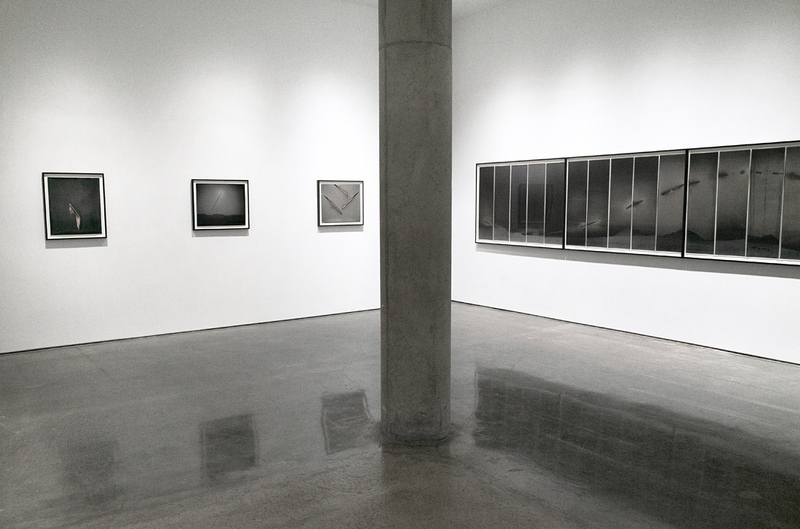 Works from the Heliograph series include multiple lines “drawn” by the sun on the same sheet of photo paper over multiple exposures. To capture the sun traveling at diverse angles, the exposures comprising a single piece are made at different times of day, in different seasons, and in locations as distant from each other as the Mojave Desert and Alaska. Seared lines may crisscross, construct right angles, or, at their most complex, form complete double arcs off-set from one another. The artist not only records the sun’s path along more than one trajectory, the landscapes are also double- or multiple-exposed, layering lines and images. McCaw’s recent Poly-optic pieces rethink the potential of the camera beyond a single lens. On a single sheet of 20″ × 24″ black and white photo paper, a grid of up to sixty-three 35mm lenses are set at different apertures from wide open (f2) to f22. Depending on the amount of light allowed to enter through each lens, the circular images formed are more or less solarized. Dialing in different apertures in varying configurations, McCaw creates compositions of light and dark that challenge the eye to negotiate 63 images at once. In addition to recent experiments with line, Direct Positive premieres new large-scale Sunburn works. 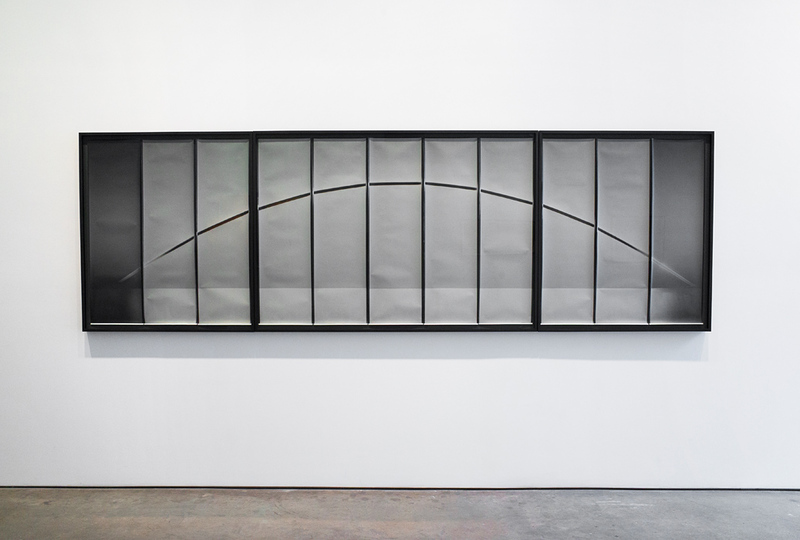 Shot with a 41″ × 12″ view camera at the Northwest border of the US and Canada, Sunburned GSP#888 (Strait of Juan De Fuca, New Year’s Day) , 2016, records the sun’s movement from sunrise to sunset across 11 sheets of photo paper in a steady arc over the strait, which glimmers with reflected light below. Almost 12-feet wide, this minimal, multi-panel piece evokes the quiet calm of the consistent weather and stable body of water over the course of an entire day. In contrast, Sunburned GSP#860 , 2015, was taken with the same camera in the Arctic Circle during the midnight sun in high-winds, rain and hail. During the course of 30 hours, including two midnights, and across twenty-five 41″ × 12″ sheets, weather conditions and Alaska’s mountainous landscape were captured. The exposure began under clear skies at sunset, with the bright sun searing its downward path through the paper and subtly toning the paper with color through solarization. When a thunderstorm rolled in at noon the next day, the camera was destabilized by wind gusts and the bellows leaked, as evidenced by the uneven arc of burn and water streaks down the face of the prints. 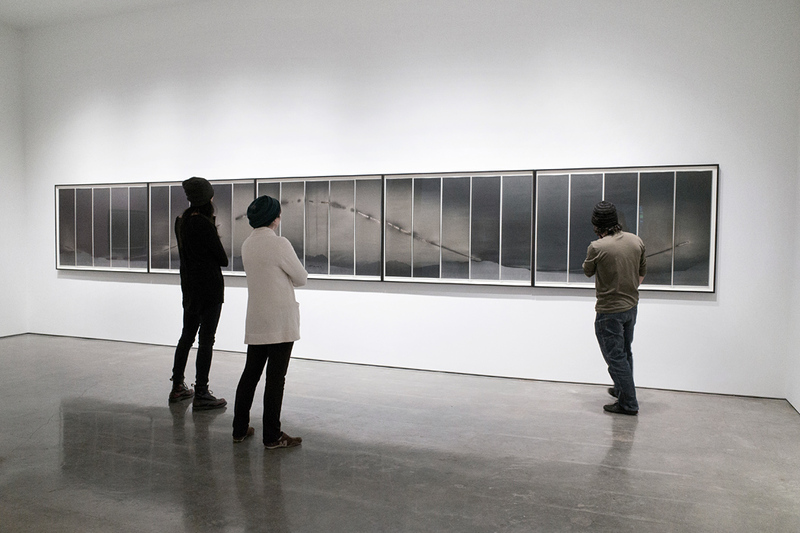 Rather than a photograph of a single moment in the storm, this monumental piece is a physical record of weather over time, moment by moment, like a film. 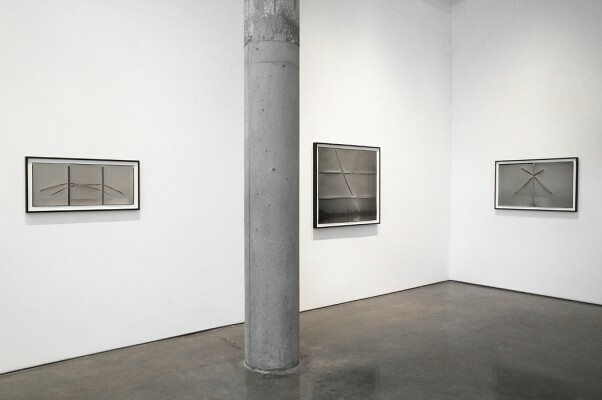 Chris McCaw’s experiments with photography follow in the tradition of the medium’s early pioneers, such as Eadweard Muybridge, as well as the history of American landscape photographers, such as Carleton Watkins. 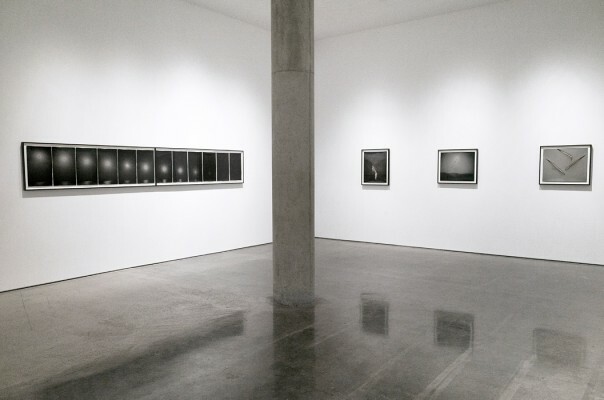 While the artist is firmly rooted in photographic history, he confronts the question of what a photograph is and what its elements – time, light, lenses, photo-sensitive paper – can be. 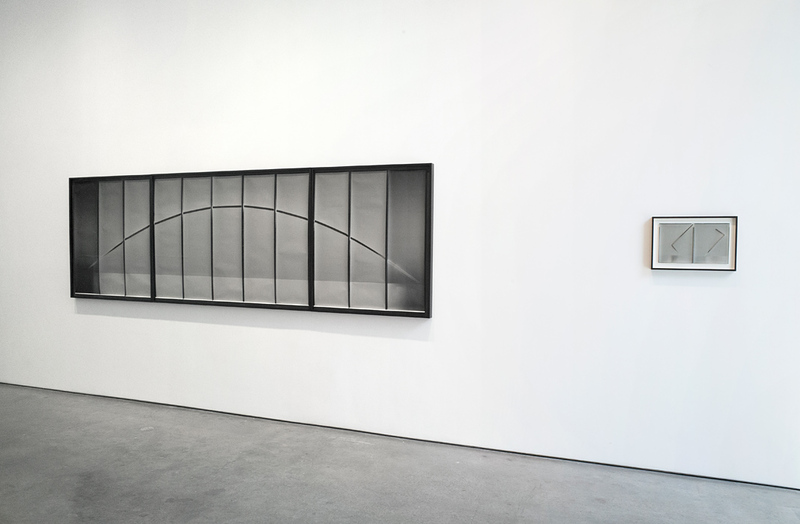 Photographs by Chris McCaw are included in the permanent collections of The Metropolitan Museum of Art, New York, NY; Whitney Museum of American Art, New York, NY; Victoria and Albert Museum, London; J. Paul Getty Museum of Art, Los Angeles, CA; Los Angeles County Museum of Art; Berkeley Art Museum, Berkeley, CA; George Eastman House International Museum of Photography and Film, Rochester, NY; Museum of Fine Arts, Houston, TX; Princeton University Art Museum, Princeton, NJ; Columbus Museum of Art, Columbus, OH; Philadelphia Museum of Art, Philadelphia, PA; Smithsonian American Art Museum, Washington, DC, and the Nelson-Atkins Museum of Art, Kansas City, MO, among others. 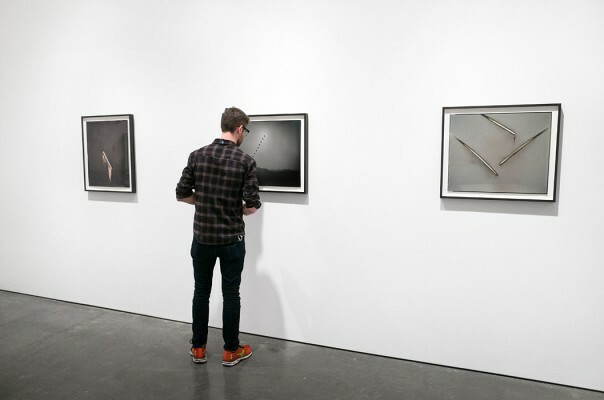 McCaw’s work has been featured in numerous museum exhibitions, including Light, Paper, Process: Reinventing Photography at the J. Paul Getty Museum in Los Angeles, curated by Virginia Heckert; The Memory of Time: Contemporary Photographs at the National Gallery of Art, Acquired with the Alfred H. Moses and Fern M. Schad Fund at The National Gallery of Art in Washington, DC; Photography and the Scientific Spirit at the John Michael Kohler Arts Center, Sheboygan, WI; Modern Alchemy: Experiments in Photography , Heckscher Museum of Art, Huntington, NY; and After Ansel Adams , Museum of Photographic Arts, San Diego, CA. The artist’s monograph, Sunburn , with texts by Katherine Ware and Allie Haeusslein, was published in 2012 by Candela Books. Chris McCaw was born in 1971 in Daly City, CA, and lives and works in the San Francisco Bay Area.